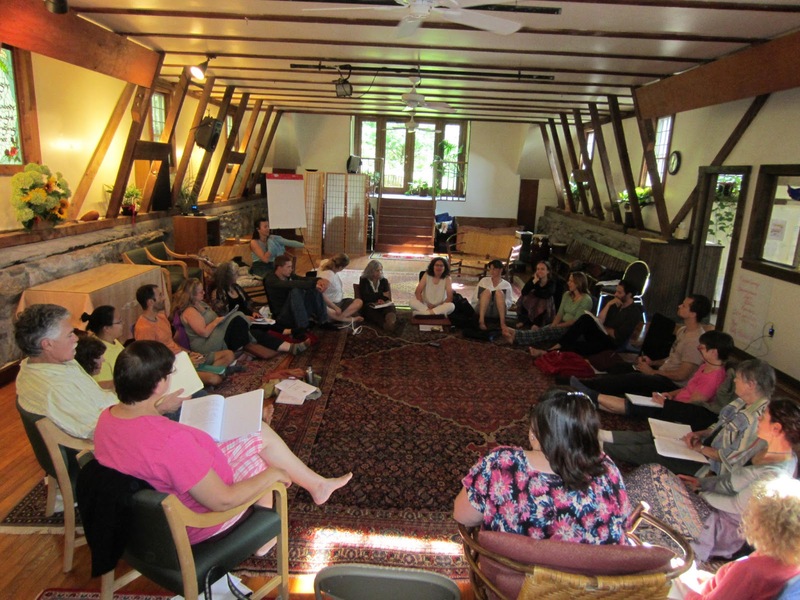 In North America, where I live and work, most people learn NVC in a workshop or a study group. This means that they are exposed to NVC in the context of learning, healing, and personal growth. The level of transformation that many people experience is such that they become excited about the potential of NVC to contribute – in their own lives, to the lives of others, and beyond, to schools, organizations, or wherever else their passion takes them. And so they come together, enthusiastic about the potential, eager to make a difference, and full of energy. Without knowing it, more often than not, they bring with them the memory of the sweet, magical intimacy of the workshops and retreats they have attended, and the expectation of having those same experiences while they work together to initiate a project. When the purpose of a group coming together is to be an empathy circle, maximizing connection makes complete sense, because it is through the connection that the healing and intimacy happen. However, when people come together to start a project or run an organization, the purpose is different: the purpose is to make things happen in the world. This means doing design, engaging in strategic thinking, making operational decisions, and attending to logistical details. Mixing up the kind of connection that supports healing with the kind of connection that supports trust and effectiveness, is likely to lead to disillusionment – with people, with groups, with decision-making, or with NVC. Instead, what I see as the path of possibility rests on understanding two key elements. One is about matching the kind of connection to the purpose at hand, and the other is about choosing the range of needs, beyond connection per se, that a group or leader attend to as part of the commitment to conscious power sharing. It is my deep faith that mastering the capacity to flexibly attend to multiple needs in multiple ways can result in groups that function effectively and collaboratively, without resorting to power-over strategies or getting mired in endless discussions that lead nowhere. The most frequent example of what can derail groups is the very common experience of someone becoming upset during a meeting. Because of the commitment to authenticity, empathy, and power-with strategies, people are no longer willing to accept masking the upset and pretending all is well, nor are they happy with overt anger, power struggles, or behind-the-scenes political maneuvering, which are so common in traditional groups. Instead, what I have often seen people do is stop the flow of a meeting and shift, automatically, to focusing primary attention on the upset person in an attempt to create full resolution. Sooner or later, someone else gets upset, usually at the loss of momentum, not getting to the agenda, or the amount of attention one person is getting. From there, things can easily cascade. This example illustrates both strands of the challenge. What I see as key to a different kind of functioning rests on keeping an eye on the purpose of the meeting, and making conscious choices, relative to the purpose, about how to attend to the upset. If a group is meeting as an “action circle,” to use Julie’s term, which means that it has tasks to accomplish, then I would want those who are leading the group to attend to the upset with care and empathy as briefly as possible, just enough to re-establish trust and presence, stopping short of shifting the focus into a healing session or embarking on a mediation with whoever’s action preceded the upset. Within that brief time, one of three things can happen. One possibility is that the upset person may settle fully and come back to full presence and alignment with the intention of the meeting. Another possibility is that the upset person will settle enough, though not fully. In that case, the issue can be placed on the agenda of the same group for when they meet as an empathy circle. If that name is odd, think of it as a time to attend to the relationships and functioning of the group, without specific operational agenda items. The third possibility is that the upset person doesn’t settle within the short amount of time that is consistent with the intended purpose of the meeting. That’s a time to either send someone out with the person to support them in recovering and coming back, or a time to make a conscious and fully informed choice about shifting the purpose of the meeting. I have done this, at times, when, as a facilitator, I sense that the level of upset or the nature of the issue are such that the group cannot in any event resume its task without growing loss to its ability to function. These are delicate moments for a facilitator or a group to navigate, moments in which nothing is perfect, and we are looking for the optimal way to balance many needs: for effectiveness in utilizing group resources, integrity in how people are held and power is used, care for everyone present, and learning for the group, to name only a few that may be present. All these choices, if done deliberately and with awareness of all the ramifications, are entirely consistent both with the importance of connection and with the commitment to power-with strategies. Still, such decisions are challenging to make for people who have become used to following healing potential all the way through to resolution. As I said, I don’t believe this is singular to NVC groups. Indeed, a new manager I have talked with recently, who was promoted from a clinical position, expressed confusion about how to shift from a therapeutic model to a management model, and how to do so without compromising his sense of who he is, which is about caring for everyone and seeing the potential for healing in every interaction. It bears repeating: which needs we attend to, and to what depth, has to do with what the purpose at hand is, and what we – collectively as a group, or as facilitators of a group – decide is consistent with that purpose. This is exactly where the confusion around power comes in, too. Often enough those who may be leading a group would shy away from making those choices for fear of being seen – by others or themselves – as compromising on the ideal of power-with leadership. Others, frustrated with what’s happening and helpless to change it, might be clamoring for decisiveness and “moving on” without realizing the cost, effectively recreating the power-over models. In many such groups people balk at being facilitators, or minimize the role of facilitator to a very narrow procedural part so as to eliminate the need to make such decisions in the first place. The either/or frame gets reinforced: we either accomplish things without sharing power, or we share power without accomplishing things. Whether the group as a whole, using whatever decision-making process they use, decides, or a facilitator guides the group in deciding, I see it as indispensable for any group to have clear agreements about when it meets as an action circle to attend to tasks, and when it meets as an empathy circle to attend to people and relationships. It’s just as challenging for a group when someone insists on taking action when the group is meeting for connection as it is for the opposite. At different times in its existence a group may have more or fewer meetings for connection, depending on circumstances and needs as they are expressed. For example, transition times and times of conflict would generally require more empathy meetings, and times of urgency with regard to certain actions would generally require more action meetings. Both are always needed. Even the U.S. military has concluded that any group needs, on average, about 20% of its time to be used for relationship building and process (I sadly lost the reference for this research). There is no one-size-fits-all for groups to be able to function. Some groups end up working better with rotating, minimal leadership, especially when there is a clear process and structure that hold the group together, and clear personal commitment to the group on the part of members. Other groups function better with a clearly designated leader, especially in the context of an organization with clear goals. Whichever path a group takes, for its functioning to be consistent with a power-with model means that people in the group have a say about how the group functions. One of the lessons I learned from Marshall Rosenberg is that the single most important decision to make collaboratively is the decision about how decisions are made. Adopting these three guidelines takes a lot more than an overall conceptual understanding – there is quite a bit of personal development and facilitation skills that are needed. I believe it’s a process over time. I still have some hope that having the clarity about what can support groups in functioning effectively without resorting to power-over strategies can increase the chances that those of us who are committed to creating a caring future can also move in that direction instead of just dreaming about it. Click here to read the Questions about this post, and to join us to discuss them on a conference call: Tuesday June 4, 5:30-7 pm Pacific time. This is a way that you can connect with me and others who read this blog. We are asking for $30 to join the call, on a gift economy basis: so pay more or less (or nothing) as you are able and willing. This week Miki is away and the call will be led by Sarah Proechel, midwife, organizer, and frequent commenter on this blog. Note: if you already registered in May, you need to re-register for June. This entry was posted in Uncategorized and tagged Uncategorized on May 31 / 2013 by Miki. The other difference is that they were raised in non-punitive households. "Mixing up the kind of connection that supports healing with the kind of connection that supports trust and effectiveness, is likely to lead to disillusionment – with people, with groups, with decision-making, or with NVC." "These are delicate moments for a facilitator or a group to navigate, moments in which nothing is perfect, and we are looking for the optimal way to balance many needs: for effectiveness in utilizing group resources, integrity in how people are held and power is used, care for everyone present, and learning for the group, to name only a few that may be present."